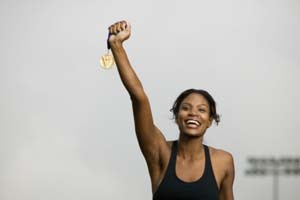 The victorious woman crosses the finish line – Eshet Chayil! The point of my post today is that often the hardest part of trying to get somewhere / waiting to achieve something is that last leg of the race. The week before your loved ones return home. The last year of uni. The last month of work before you resign from your old job and start your new one. Our writing projects often get abandoned right at the end. I’ve written 42 / 50 chapters for a book that I told everyone I was going to finish in 2011 – now that’s awkward! And the reason why is that I know how to start with a bang, and the middle is the crux of the story, so that’s pretty set in my mind, but wrapping it all up just looks too big. I don’t know how to reach those last things that are needed for each of my characters to say, “My part in this story is done, and I’m happy with where I’ve ended up.” For some characters, I don’t even know what is needed to finish their part. Jeff Manion spoke at the 2010 Willow Creek Global Leadership Summit about his book, ‘The Land Between: Finding God in difficult transitions’. He said that the point at which leaders’ plans fail, and people stop volunteering to help, and churches dissolve, is not when you expect. It’s not at the beginning, because even though looking at a blank slate is scary, most people will be able to imagine the vision that you are setting forth as leader, and it’s exciting to look forward to a future full of hope and promises. People are happy to give time and money and effort to help a new project get off the ground. And even in the middle, it’s easy to stay committed, because you can see progress in the steps along the way. But in that last leg, it’s often hard to see whether or not it is the last leg. If it looks just like the middle is continuing on forever, then it’s easy to get discouraged. The last few steps just look too big, and getting through the middle may have drained your resources and energy and passion for the project. We can fall with the finish line in sight, when we do it in our own strength. I drove a friend home from a meeting recently and he was reminding me of others who have fallen near the end of their personal race. He spoke of the Israelites wandering through the wilderness of the Sinai Desert, and how when God first promised to give the promised land to this slave people, they said, “No way, we can’t do that.” And when they were nearly there, they blew it many times by rebelling against God, even though the end was in sight. Moses was literally up the mountain fine-tuning the Ten Commandments when the people decided it was never going to happen and made themselves a golden calf idol to worship instead. I want to keep running with perseverance the race that God has set before me (Hebrews 12). In the writing context, this means that I want to finish the projects that I start. This post was written by TJ Withers-Ryan © 2012. Reblogging is highly encouraged as long as you credit me as the author.